Below you see a post from the Gray Area congratulating Target for not giving in to radical complaints from leftist activists about their gender signage. Well, a correction is necessary, after first standing on their research into signage decision, Target caved, announcing on August 7th they were eliminating gender signs in their stores after ‘guest’ feedback. Therefore, we print this correction to our original post and a new message for Target – MEOW! I never thought I would say this, but congratulations Target. 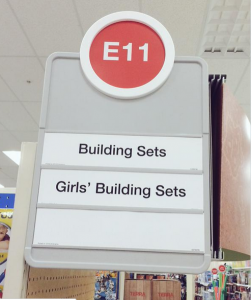 Radical feminist lunatics began tweeting complaints about Target’s display of “building sets” in their stores. Target did not back down, using common sense and business research to determine how their customers prefer to see products labeled, not how political special interests prefer. Target [said they] will continue to identify items – among a variety of other markers – by gender. “At Target, our goal is to provide our guests with choices. In our toy department, we offer a wide assortment of unique, differentiated, must-have merchandise, that children of all ages, stages and interests will love. We know families are tight on time and looking for inspiration. Therefore, we continually explore how to organize our stores and website in ways that will be convenient, appealing and helpful to our guests.